I think prayer may the the most difficult thing for me to practice – not the kind of prayer that thanks God for my blessings, acknowledges the beauty of creation, requests healing or help for others or even prayers of confession but the quiet, silent, listening prayer. As an extrovert meditation and contemplative prayer don't come naturally, I've had to work at it. It's a little like beginning an exercise program. I knew I needed to develop a practice of weight bearing exercises. I knew that it was critical to my well being; that it would help reduce my cholesterol and strengthen my bones. I also knew that there was no substitute for lifting weights. But none of this "knowing" was going to make it happen until I took the first step. As Jesus said to his disciples, "The spirit is willing, but the body is weak." Last December I started a regular practice of going to the gym. At first it was awkward. I felt like a novice, like I was doing everything wrong. Eventually I started to see progress. I could lift heavier weights. I began to really see the difference. Then I got my bloodwork back and I had concrete data that said this practice is changing things. Practicing meditative and centering prayer has been a similar experience for me. I knew in my head that I needed to do it, I just needed to make my body comply. At first I felt silly sitting in silence waiting for something to happen. Inevitably I would fill the void with my words then I would scold myself and feel like a failure. One day someone said to me, "Be nice to yourself. Be patient. It takes practice." With that everything changed. Like going to the gym, I set aside time every morning to be still. I first read from the Bible then I practice my time of silence. Sometimes I put myself in the story, sometimes I think about a specific verse and sometimes I just sit in silence. At first I did this for about five minutes each day. Eventually as I have become more comfortable, my time has lengthened. Like going to the gym, I was encouraged when I started to see progress. My days are more peaceful and I am more aware of God's presence in my life and the lives of those around me. I still have much to learn about prayer but the practice of listening is changing things. Like going to the gym regularly for my physical health, I can't imagine not spending time in silence for my spiritual health. Francois Fenelon said it this way, "The more you seek for God, the nearer He will be to you; every step that you take toward Him will bring you peace and consolation." The post Sit Still – Really appeared first on Today I Saw God. I was born kinesthetic.Not until some time later did I realize I had God to thank for that. Not until I came to know Jesus did I realize I had to do something about it. Several Washington Nationals players drove this home for me during the post- game celebration of Faith Day at Nats Park. There, a group of professional baseball players who had just slugged it out for an awesome nine innings, sauntered over in street clothes to talk with us about God, Jesus and baseball. I like to say (and even write :)) that I'm a Kinesthetic Christian, but these guys take this to a totally new level. They're way better at being kinesthetic than I am. They've certainly made WAY more of their gift than I have made of mine. Yet, one by one, they share honest stories of struggle in the midst of their exceedingly successful careers in baseball one via relationship, one due to injury and one in a dire crisis of confidence. When these guys thought they had finally "arrived," the bottom fell out. Forced to give up what they had always dreamed about, a door opened to something they hadn't known was missing. That's when faith took hold. Murphy calls it filling a "Jesus-shaped hole." And he is candid about speaking not just about God but about Jesus. His savior is Jesus; he'll say it again, Jesus. Because, says Murphy, "Jesus demands a response." Wow. I can get on board with that. God has a lot of names these days and shows up in a lot of places. But Jesus, now that guy makes demands. If you follow Jesus, he shows up and then asks, What are you gonna do about me?! Over the weekend, the major league ball players wore youth-style jerseys with a spot on the sleeve to write the name of a person who has aided their career. Murph wore "JESUS." He's proclaiming the name all over the tv screen, because Murph is all over the tv screen. For his time in the spotlight Daniel Murphy's got a platform, and he plans on using it. During his turn in the batter's box he makes plain that he is a Christian and is doing his darnedest to be a good representative of the family tree. God made him a good baseball player. Jesus demands a response. All three ball players who were interviewed by Nats commentator Bob Carpenter confessed that it's never easy in the "Big Leagues." Here, as celebrated athletes at the top of their profession, they bubble in a daily cauldron of nearly unimaginable pressure Perform now. The game, the season, your career is on the line. Talk about tension! They have discovered the secret to tension. "There's more to life than baseballWe need to be a light to all the others." Interviewer: "So what is your advice to young players who want to play pro ball?" Athlete: "You just have to believe in yourself and never give up." NO!!! I want to holler back. Believing in yourself, even with the grittiest of discipline, will only get you so far. To get the rest of the way, you have to surrender. Surrender success, achievements, medals, trophies, and even the World Series ring. Give it all to God. Then, when you can subsist on what's left after giving up all that, Jesus meets us, ad it's the best thing ever. Better than we could have ever planned, imagined, or dreamed. God doesn't want our trophies; God wants us. This is the message these ballplayers are trying to live out. Wieters, Rendon and Murphy, plus Goodwin, Drew, Taylor, Lobaton and NY Met, Brendan Nimmo, are here to let us know it. I'm looking at you guys through different eyes now. You take kinesthetic to a whole new level, and its good, very good. I hope it takes you all the way this year because really, what would God do with a World Series ring, anyway? It was a great game. It had me on my feet a lot, and I'm making no apologies for that. It's just the way I'm wired. When I see a great play, I'm on my feet. Throw a guy out from center, peg a guy out from third, make a diving grab, homer, RBI, strike them out I'm up! Clapping. Hollering. I can't help it; I'm kinesthetic. I was born that way. So now I am asking myself Why am I not on my feet when my pastor hits one out of the park? When God makes a great play, why am I satisfied to applaud politely from my pew? What if I were as enthusiastic about my faith as I am about my favorite team? Thank you for speaking up, Matt, Anthony, Murph and friends.God may speak with a still, small voice, but Jesus demands a response.You are living yours out in front of us. Thank you for reminding me that I must live out mine. The post God, Jesus and Baseball appeared first on Today I Saw God. This scripture has been pervasively showing up over the last few months. My regular reminder that if we focus on God we will be given what we need and be used for God's glory. I am in constant need of this reminder, but I evidently wasn't getting the message. I have a problem. I don't like to say no. One of the shortest words in the English language and I struggle saying it. My friends, family members, therapists and supervisors over the years have tried desperately to teach me how to say that word. I don't say it because I like to be helpful! I HATE to disappoint! And, truth be told, I impose others' expectations on myself, some of which don't actually exist. I have been this way my whole life. In fact, my college roommate used to tell me that I was the busiest person she knew. She still tells me, "you always were the busiest person I know"; because I never say no, not to myself, not to anyone. Maybe that is why I acclimated to Northern Virginia culture so easily. In my twenties, I lived in London for a time as well as New York City. I think I felt at home in these places because their pace could keep up with me! Just like those other cities, here in NOVA we are all moving at a million miles a minute, to accomplish a laundry list of tasks that are not ever realistically going to fit into a 24-hour period. And, sleep should fit in there somewhere. Not one of us is the exception. We all do it. We go, go, go all the time and in the busyness things get forgotten or forsaken. Over my time in ministry, I have developed some pretty solid self-care practices at the urging of my mentors and seasoned clergy who have experienced the consequences of failing to practice consistent self-care. I have faithfully observed the Sabbath, not only for my own good, but because God gives us that example and calls us to a day of rest and worship. I have talked to many others, who likewise manage to take care of themselves faithfully and still conquer the world all in a day's work. But, no matter how well we take care of ourselves with diet, exercise, sleep and spiritual disciplines, when we embrace a busy lifestyle and are immersed in a culture that supports that lifestyle more often than not, the busy wins and we lose sight of the parts of ourselves that are more easily lost. These parts are the hardest to see. You can usually look at someone and tell if they are taking care of themselves or under stress. But so often, the part of us that is screaming to be cared for is the part people don't see because we've gotten very good at smiling, nodding and social niceties. That's where I found myself a little over 6 months ago; tired, empty, neglected and disconnected because in the daily grind, checklist and even in the fun, I was not allowing my "cup" to be filled. Sure, I was taking my days off each week, I was taking vacation, I was worshipping regularly and exercising regularly but I was still in way over my head. I let some people see but for the most part I kept swimming because if I could keep swimming I could trick myself into being ok. Between a busier schedule than I could manage and navigating a hard life event, I was done. I had reached that irrational place of done. You know, when you want to quit everything?! So, I pondered what to do to help me get my head back above water. Thanks to divine inspiration and the gift of a phenomenal benefits package and supervisory staff. I figured it out! I asked to take a 4 week Sabbath, a mini sabbatical if you will, and IT WAS APPROVED!!! As the time for my Sabbath approached people would ask what I intended to do with my time. Where was I going? What fun thing was I going to do? Each time I explained that I was not planning my time. I shared and reminded myself that I am an over scheduler. I knew that if I started filling up the time it would be full and gone before it even began. But, it was actually a good question to consider, "what am I going to do with my time off"?! I thought about what I was missing, which of my cups were empty, and which parts of me I had lost. I came up with 3 guiding focuses and a challenge for myself. I realized I needed to fill my time by practicing stillness, reconnecting with God and finding joy. It has been my observation that of all these things, joy is usually the first thing to get lost. When we are stressed, tired, grieving, empty, angry, sometimes even busily content, we lose joy. The challenge that I gave myself was a means of accountability. I was going to pursue these 3 things by posting a photo a day that illustrated how I spent that Sabbath day. So, even though I didn't make specific plans I really did have big dreams for my month. I was going to do all of the things I'd been wanting to do and hadnt't had time for! Berry picking, sleeping in, catching up with friends, laying by the pool for hours each day, reading 15 books, crafting, organizingit was going to be epic! But, as is the case with life, things didn't go like I had planned. I didn't leap tall buildings or climb high mountains each day and in spite of that, each day was full and spent just as I needed to. Here's what's interestingturns out I don't know what I need as well as God does. Even when the day didn't meet my desires or expectations it ended up being exactly what it should be. What I did faithfully was approach each day with a willing spirit to see what the day might bring and how God might show up. Each day I did manage to find stillness and I embraced it! I didn't fight the stillness and silence. I didn't try to fill it up; instead I reminded myself that stillness is wonderful and necessary and a sign of strength instead of weakness. I told people that I love and care for "no". With that "no" came a shift, in me and in relationships. Bottom line, I woke up every day with an attitude of intentionality. I wanted to make the most out of each day because they were precious gifts of Sabbath. They were MY four weeks and I needed to make the most of them. When it was all said and done and I began preparing to return back to my daily routine (the one that involves working, homework, taking my niece to school, etc) I found myself thinking about all that I discovered during my Sabbath and all that God showed me. I have this new perspective now. I also have an awareness that this perspective can be far more easily lost than it was gained, but I can draw from it and remember how full my soul was, simply because I was available, flexible and intentional. 1- God will surprise you if given the room to do so. 2- We truly must let go of the things that bind and hinder us if we really want to live. Holding on does no one any good. 3- Over ambition is overrated. At the end of our lives what will have mattered most? 5- "No" really is a powerful word. And, it doesn't have to mean that someone will be hurt if you use it. As it turns out it may actually deepen your relationship. I don't know the next time I will have a month off. I don't currently have my next vacation planned. But I now have experienced what happens when you intentionally focus your time. We've all heard the saying "yesterday is history, tomorrow is a mystery, today is a gift, that's why it's called the present." Well, that's real. In a moment, things can change and we never know when that moment will be or what it will bring. So let's make the most out of what we've got. I will continue to start each day with a desire to connect with God, to find joy in even the small things and to make time to be still. I hope you will join me. The post Sabbath appeared first on Today I Saw God. I never knew that Mexican food could become a part of my spiritual practice, but growing up I began to equate chicken soft tacos with church. In a small town, there aren't many restaurant options. However, during middle school we were finally blessed with a restaurant named "Little Mexico." I'm not really sure when it happened, but at some point it became understood that Little Mexico would be the central meeting place for most people in town following Sunday church services. My sister and I would (occasionally) grumble under our breath about our Baptist pastor's lengthy sermon, for fear it might cut into our precious lunchtime. "If he doesn't wrap it up, the Methodists are definitely going to beat us to lunch and hijack all the long tables." Somehow week after week, they were always victorious in the race to lunch. Often my family would grab others from church to join us, and the one-hour meal stretched to two or three as we casually strolled from table to table chatting with friends in the community. For a while, our ritual was so predictable that servers stopped asking for our order. They already knew exactly what we wanted. Sometimes we re-hashed the sermon or dissected musical choices, but mostly we simply laughed, shared stories and fought over cheese dip. After moving to northern Virginia, there were times when I would experience intense cravings for Little Mexico. "Why?" I wondered. By culinary standards, it is not necessarily the best Mexican cuisine I've ever tasted. (If you are reading this from Big Stone Gap, I apologize, but I speak truth. Okay yes the cheese dip wins). However, I would still rate this as one of my all-time favorite restaurants. I believe it is because of what it represents. This average strip-mall eatery is symbolic of the importance of a shared meal. It is communal and tugs on a primal need we have as humans. Early Christians understood the importance of a shared meal, and Jesus often used these as opportunities to teach. Jesus dined with the unholy, causing outrage amongst religious leaders yet providing a shining example for inclusion. He did not adhere to social norms of hierarchical seating arrangements. Rather, he used this occasion to teach the importance of humility. Some of Jesus' most interesting miracles involved providing large groups with the opportunity to eat and drink together when there simply didn't seem to be enough food. It should not surprise us that Jesus, knowing he was going to be betrayed by his disciples within hours, still chose to spend his last evening dining with them. He then gave us a precious gift of communion, which allows us to remember him. Breaking bread together is important. We've read all the studies that tout the benefits of family dinners. Most of these focus on how important this interaction is for the development of children. However, I think we neglect to realize adults also need to commune and dine with others to keep our soul healthy. A shared Sunday meal could be a continuation of our church experience that is missing from our spiritual practices. Unfortunately, I believe this is where northern Virginia pales in comparison to its rural, small-town counterparts. In an area in which busyness is currency, we simply don't have time for such a weekly ritual. Travel soccer and swim meets dictate entire family schedules for weekends and holidays. In a transient community such as our own, state lines and even oceans split families so the common practice of meeting at Grandma's house isn't always an option. Our church has grown to a size in which even something as simple as a Sunday potluck after a service is no small feat, and it requires extensive planning and logistical efforts. For me, Sunday begins with a 5 a.m. alarm, and I usually don't see my home again until 8 p.m. I get it. Sundays are hard. Plan a meal after a service with members of your small group. If you aren't a part of a small group, now is a great time to join! Join Dinner for Eight, or a similar program if your church offers such a thing. The dinners might not take place on Sunday, but it will still be a great experience to share a meal in someone's home. If your church does not have this program, look into starting one. Ask if any parents in your child's Sunday school group are interested in starting a Sunday lunch bunch. Plan a progressive meal with members of your neighborhood or apartment community on Sundays. This way you are only tasked with creating one dish. If you are part of a ministry team in your church, ask the leader or other members if they would be interested in dining out together after your service has ended. This fall, I've decided to put my money where my mouth is. Members of our music ministry team have lobbied for this exact occasion, so we are implementing "Second Sunday Supper." If anyone would like to join us after the 5 p.m. service once a month, we'd love to get to know you! Feel free to contact me at the church or come see me after a service for more information. I love food. But most importantly, I love sharing food with others. Maybe it's the Southerner in me, but I think our stomach is an integral part of our faith journey. This fall, I hope you will find ways to incorporate this into your life. And if you're feeling really adventurous, maybe we can make a carpool pilgrimage to Little Mexico someday for the best cheese dip of all time. The post How to Restore the Lost Art of Sunday Supper appeared first on Today I Saw God. 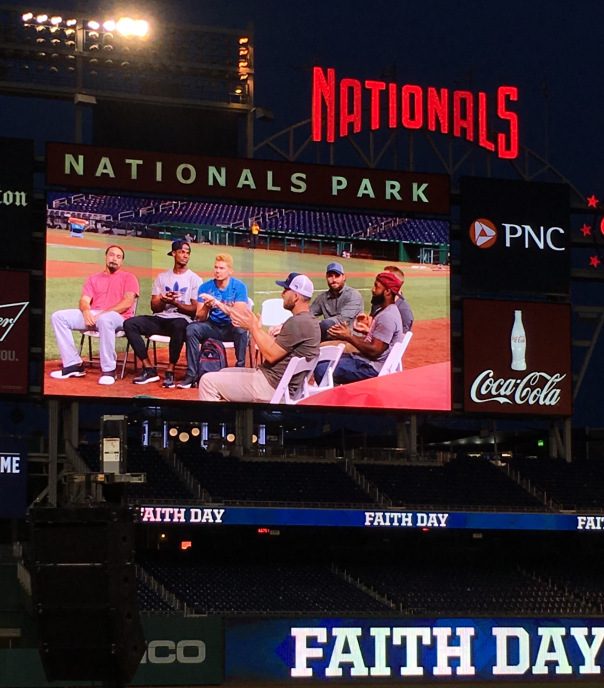 I had the opportunity to take my family to the Nationals Park for Faith Day on Saturday afternoon. We were really excited to go for many reasons, and the day could not have been better. Although we had been to many minor league games over the years, this was the first MLB game that we had attended. The weather was just perfect. Nottoo hot, low humidity and a nice breeze — the best weather we could have expected for a late-August afternoon watching baseball. When we arrived, we saw Natasha Smith and Mike Dickerson and were very pleased to know they would be performing after the game at the Faith Day event. I was so happy for them, and I could see it on their faces that they were looking forward to performing — they were smiling from ear-to-ear. The game was very entertaining. The Nationals were playing the New York Mets, and the crowd roared as the Nats took the field to begin the game. A great start to what would be a wonderful evening. It was nice to see the familiar faces of members of the Floris UMC congregation having a good time with friends and family members as the game continued inning to inning. I watched my daughter take it all in as she scanned the stadium while watching the game. One of her highlights was seeing the Presidents race around the field. As I sat there, I remembered years ago having the opportunity to throw out the first pitch at a minor league game in southwest Virginia. I held my then 2-year old daughter in one arm while I threw out the pitch. As I walked off of the mound I remember all of the players coming over to say hello to my little girl, and the catcher handed her the baseball I had thrown. As each player spoke to hershe would giggle and laugh, which in turn, made many of them smile in response. Today as I watched my daughter at the game, I can still see that 2-year old laughing, but now in the face of my teenager. Lasting memories of a father and daughter at a ballpark. At the end of the game, the scoreboard read Mets 4, Nats 9. It was now time to enjoy the "Faith Day" portion of the evening. As everyone gathered in sections 112-114, the program began with a video of a number of the players giving testimony, gladly telling how important their faith is in both their professional and personal lives. We then watched Natasha and Mike perform two beautiful songs, and Natasha gave a "shout out" to her friends from Floris UMC. They both did a great job, and it was obvious the people in attendance enjoyed the performance. The evening was filled with live testimony from the players, and it was nice to see both teams represented at the event. I was so glad we were able to attend this event, and we are already looking forward to Faith Day 2018. The post Faith Day 2017 appeared first on Today I Saw God.